A Review of a Steady State Coherent Bio-modulator for Tinnitus Relief & Summary of Efficiency and Safety Data from the Clinical Study Program and Post Market Clinical Follow-up. Objectives: To evaluate a non-energy consuming light bio-modulator patch creating coherency for tinnitus relief. Materials and Methods: Three independent clinical studies and continuous post market clinical follow up have been performed during the year 2012 to 2018. The first study was a limited interventional investigation with 10 patients, the second was a larger interventional study with finally 48 patients further investigated, and the third a randomized, placebo-controlled, double-blind study with 82 patients. In the clinical studies patch performance evaluated with questionnaires related to tinnitus, quality-of-life, and safety were assessed prior, during and after the end of treatment. In all studies the treatment time was 3 weeks and the patches were placed behind one year. Results: The first study indicated a relief with half of the patients at the end of the treatment. Still two years after the study one third reported tinnitus relief. However, the numbers of patients were low. The second study showed a responder relief in 58% directly after end of treatment and 60% one month after. The third study showed that the bio-modulator patch had statistical significant three times more responders than placebo one month after end of treatment, measured as a decrease from baseline in at least 2 points in tinnitus annoyance visual analogue scale as a minimal clinical significant difference. Tinnitus handicap inventory was improved by mean -16 points significantly for the active responder group, but with no statistically significant changes for the placebo group or between the groups. The bio-modulator patch was safe and well-tolerated in all three studies. The post market clinical follow up has shown a 30% reported relief and with no new risks or unexpected issues affecting the effectiveness or safety. Conclusion: Taken under consideration the lack of easy-to-use alternative and the low risk profile, this patch device could highly be recommended to try for tinnitus relief as a conclusion based on the clinical studies and post market surveys. Further studies of how this bio-modulator more specific act on the auditory system, how long this may sustain and if there can be subgroups of patients or variations in the treatment time, delayed onset, number of patches, and frequency for more efficiency needs to be considered. There is currently no established uniform and wellfunctioning treatment. The most common treatments try to alleviate the possible causes behind by testing hearing aids, sound therapy, cognitive behavioral therapy and physiotherapy, or a combination of them. The treatments above are widely given in many countries and consume heavy healthcare assets and long-term patient attention. The activity in the brain could be considered as an organized consistency or coherent state when being without tinnitus in a quiet and resting environment [1,2]. We also know that tinnitus sufferers seem to have hyperactivity in the auditory cortex and activated networks involving thalamus and amygdala [3,4]. This raises an interest in coherency and soothing the neural network as possibility for a relief. The steady state bio-modulator (Antinitus®, Sensori AB, Sweden) consists of a very small Fourier raster in a silica polyethylene terephthalate (PET) embedded in a skin patch. The patch is intended to be placed at the cranial base behind one ear and replaced daily for 3 weeks. When ordinary light passes passively through the patch the light organizes in a coherent stage and affects the water and moisture close to the skin in a similar way, creating a spreading non-energy consuming selforganization process5. The principles for the hypothesis of bio-modulation are schematic shown in Figures 1-3. 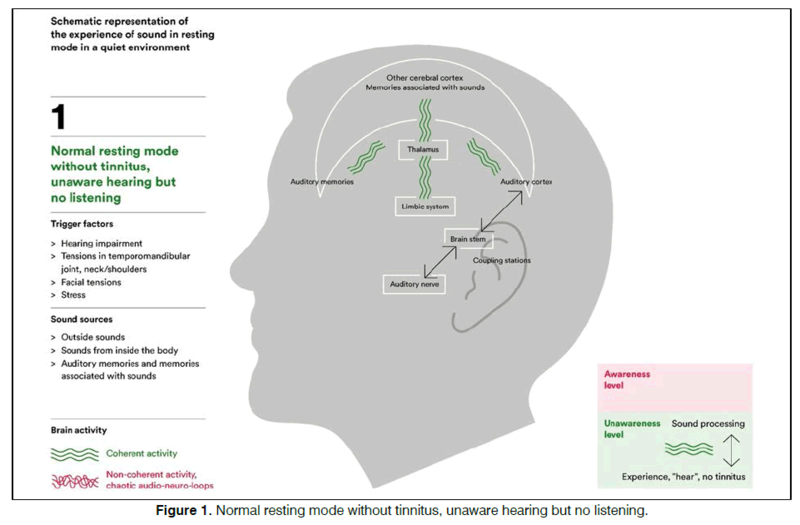 Figure 1: Normal resting mode without tinnitus, unaware hearing but no listening. Figure 2: Resting mode with tinnitus, aware hearing creates listening for sounds from inside. 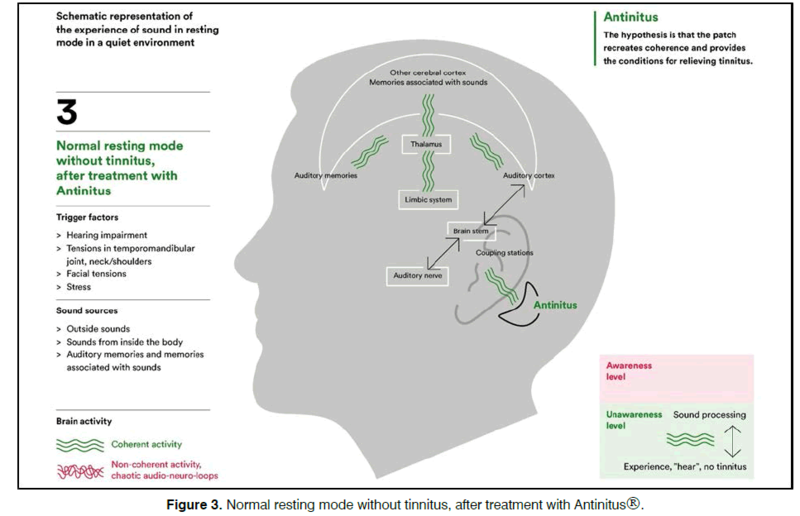 Figure 3: Normal resting mode without tinnitus, after treatment with Antinitus®. Moderate: We are moderately confident in the effect estimate: The true effect is likely to be close to the estimate of the effect, but there is a possibility that it is substantially different. Low: Our confidence in the effect estimate is limited: The true effect may be substantially different from the estimate of the effect. Very low: We have very little confidence in the effect estimate: The true effect is likely to be substantially different from the estimate of effect. 1a: Systematic reviews (with homogeneity) of randomized controlled trials. 1b: Individual randomized controlled trials (with narrow confidence interval). 1c: All or none randomized controlled trials. 2a: Systematic reviews (with homogeneity) of cohort studies. 2b: Individual cohort study or low quality randomized controlled trials (e.g. <80% follow-up). 2c: "Outcomes" research; Ecological studies. 3a: Systematic review (with homogeneity) of casecontrol studies. 4: Case-series (and poor-quality cohort and casecontrol studies). 5: Expert opinion without explicit critical appraisal, or based on physiology, bench research or "first principles". Safety issue must also be of vary careful consideration and is the single most important factor in regulatory aspects for national Food and Drug Administration (FDA) and Medical Products Agencies (MPA) in medical devices. This was a study focused on safety and overall efficiency. In this interventional uncontrolled study about half of the patients reported a relief of tinnitus at the end of the treatment and they continued to experience relief one month after the end of the treatment schedule8. The 2-years follow-up after the treatment showed that still one third reported a sustainable relief of their tinnitus. There were no safety concerns during or after the study. This was however a study with a small (n=10) number of patients and it can be considered as Level 3 in EBM. The original study design and aim was to investigate the efficiency and safety for the bio-modulator patch in comparison with placebo patch in a larger interventional study. However, the placebo patches were by production errors verified after the study to be semiactive and therefore not useful as placebo patches to be compared with the active patches. Total number studied patients were 97 (100 at baseline and 3 drop-outs). The total numbers of patients receiving active patches were 48. The following results are based on this group. Baseline characteristics and results after week 3 and week 7 (4 weeks after end of treatment) were compared. The outcome showed a responder (VAS, Visual Analogue Scale Tinnitus Annoyance and/or TSQ score) relief in 58% of the patients directly after end of treatment and 60% one month after. The safety evaluation did not present any safety concerns, and the related skin reactions were of mild intensity and were resolved within 20 days after end of treatment. This is considered as Level 2b in EBM, but the results are unpublished because of the protocol deviation. In this dual-center placebo-controlled study with total 82 patients we found a 30% responder rate as decrease from baseline in at least 2 points on the tinnitus annoyance VAS compared to 10% in the placebo group . Tinnitus handicap inventory (THI) was improved by mean- 16 points significantly for the bio-modulator responder	group, but with no statistically significant changes for the placebo group or between the groups. There was no significant difference in performance between the bio-modulator and placebo groups directly at the end of treatment. The safety evaluation showed comparable results in the two treatment groups as measured by the collected adverse events. No safety or tolerability concerns were identified. This is considered to achieve Level 1b in EBM. A post treatment survey was performed with each customer some weeks after they have received their product. It was only possible to reply to the survey once, and with a unique log in, only available to the specific customer. The result from the latest performed post treatment survey from 21st of March 2018 is presented below. Question number 7 in the survey was “Did you get any relief from your tinnitus during or after you used the Antinitus® patch?” and the response from 597 responders is illustrated in the Figures 4 and 5. 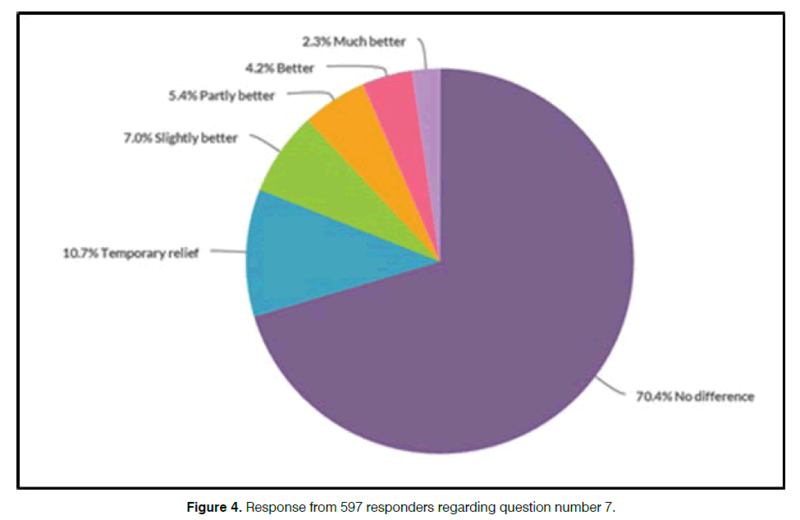 Figure 4: Response from 597 responders regarding question number 7. 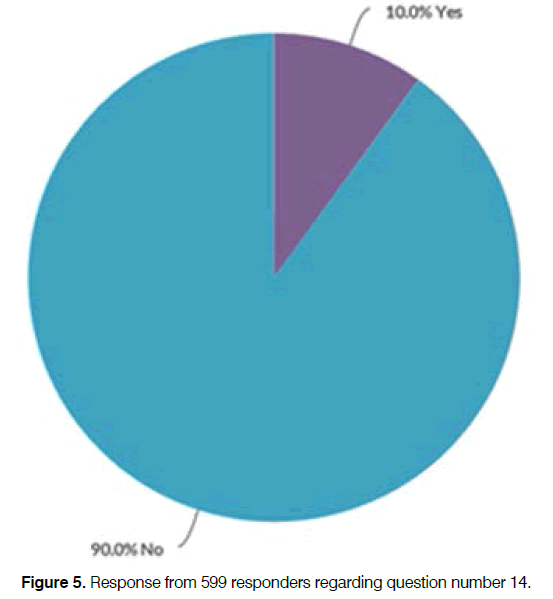 Figure 5: Response from 599 responders regarding question number 14. Tinnitus experts agree that treatments that just have a small but significant effect would have a huge impact . Neuro-modulation and bio-modulation are raising an increased interest in the understanding of tinnitus and treatment options. A Swedish bio-modulation raster in a skin patch for the use behind the ear has been widely investigated in three clinical studies and post market surveys. The review of these shows that in summary the patches can be very reasonable to recommend as an evidence-based and non-expensive treatment for tinnitus relief. There were also no safety issues in the studies or the surveys. The effect seems to come gradually during the treatment and often with a delayed onset at least one month after end of treatment which encourages further research on longer treatment periods and repeated cycles, which also has been indicated by the post market follow up surveys and proven experience. The summary has also been partly presented at the Tinnitus Research Initiative (TRI) Conference in Regensburg, Germany, 14th -16th of March 2018. Raichle ME, MacLeod AM, Snyder AZ, Powers WJ, Gusnard DA, Shulman GL. A default mode of brain function. Proc Natl Acad Sci USA. 2001;98(2):676-82. Greicius MD, Krasnow B, Reiss AL, Menon V. Functional connectivity in the resting brain: A network analysis of the default mode hypothesis. Proc Natl Acad Sci USA. 2003;100(1):253-8. Schlee W, Mueller N, Hartmann T, Keil J, Lorenz I, Weisz N. Mapping cortical hubs in tinnitus. BMC Biol. 2009 Nov 23;7:80. Elgoyhen AB, Langguth B, De Ridder D, Vanneste S. Tinnitus: Perspectives from human neuroimaging. Nat Rev Neurosci. 2015;16(10):632-42. Johansson B, Sukhotskaya S. Allometric scaling behaviour-A quantum dissipative state implies a reduction in thermal infrared emission and fractal ordering in distilled water. Water J. 2012;3:100-21. Evidence-based medicine working group. Evidence-based medicine. A new approach to teaching the practice of medicine. JAMA. 268(17):2420-5. The Grading of Recommendations Assessment, Development and Evaluation (GRADE) working group. Ahnblad P. Pilot Investigation of a topographical filter dermal patch in patients with tinnitus. Int Tinnitus J. 2017;21(1):7-13. Ahnblad P, Nordkvist A. A randomized, placebo-controlled, double-blind, parallel groups study evaluating the performance and safety of a steady state coherent biomodulator patch in the treatment of subjective tinnitus. Int Tinnitus J. 2017;21(2):157-67. Langguth B, Salvi R, Elgoyhen AB. Emerging pharmacotherapy of tinnitus. Expert Opin Emerg Drugs. 2009;14(4):687-702. Paper submitted to the ITJ-EM (Editorial Manager System) on May 02, 2018; and accepted on June 14, 2018. Citation: Ahnblad P. A Review of a Steady State Coherent Bio-modulator for Tinnitus Relief and Summary of Efficiency and Safety Data from the Clinical Study Program and Post Market Clinical Follow-up. Int Tinnitus J. 2018;22(1):72-76.